Khushwant Singh is widely recognised as one of India’s finest historians and writers. Yet even he took a long time to assimilate the horror of Partition before finally publishing The Train to Pakistan nine years later. Singh was living in Lahore and his Sikh family had little choice but to head for India, leaving their home and valuables in the care of a trusted Muslim friend who protected both and later sent everything to his friends – even the half-drunk bottles of alcohol in the drinks cupboard. Margaret Bourke-White was sent to India in 1946 by Life magazine to document the fall of the British Empire. Once you’ve seen her photographs you can appreciate that she was both a very brave woman and one with an extraordinarily steady hand and strong stomach. She had previously photographed German concentration camps so perhaps death and devastation had become her bread and butter. In the village of Mano Majro, the Sikhs are the landowners, the Muslims their tenants and the district magistrate is a Hindu. It’s a model of calm country life and inter-racial harmony. Into this peaceful setting arrives a band of dacoits (bandits) who rob and kill the local money lender – a Hindu. The police arrest the usual suspect – a local bad boy (or budmash) by the name of Jugga Singh. He would have a cast-iron alibi but it’s not one he can use – he was with his Muslim girlfriend, the daughter of a local weaver and the mullah at the local mosque. Her dad will skin Jugga alive if he finds out they’ve been together. Arriving the day after the killing, the mysterious European-educated young man with the ambiguous name of Iqbal heads to the Gurdwara (Sikh temple) to ask for a place to stay and finds himself also arrested in connection with the dacoitry. So far it’s just the village politics of small lives in the country. But suddenly, whilst we are quietly learning about the characters of Mano Majro, a train pulls into the station and is surrounded by the police and army. The villagers stand on their rooftops trying to find out what’s happened – why has nobody left the train? Where are all the passengers? 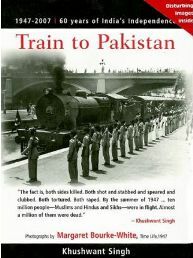 When they are all asked to bring whatever wood and oil they can spare to the station, it becomes apparent that the train was filled with the slaughtered bodies of Sikhs fleeing Pakistan and the materials are needed for a funeral pyre. Mano Majro is suddenly thrown into the harsh reality of mass exodus. What had previous been rumour is suddenly reality. The people swear it won’t happen to them, they won’t see harm come to their friends and neighbours, things don’t need to change. The summer of 1947 was also marked by some of India’s worst ever flooding. Soon the rivers rise and fill with the floating bodies of slaughtered and drowned animals and people. Mano Majro can’t ignore the outside world any longer. Realising that the village will soon have to take in Sikh refugees, the locals decide it really would be safer for their Muslim friends to go to the refugee camps – just until it all calms down and they can come home again. Soon we see how the people of Mano Majro are influenced by outsiders and corrupted to turn on their old friends. Plots are hatched, tales are spread of death and destruction in other towns and villages, a frenzy is whipped up very quickly and when a second train of corpses arrives, there’s no wood to burn them and a giant pit is dug beside the railway. Will the activists succeed in carrying out their plot or will someone take a stand and prevent devastation and destruction and a complete collapse of civilised behaviour? Iqbal – who is the mysterious young man and is he really what he seems? What is his religion and why won’t he confirm it? Every one of these characters was based on someone that Khushwant Singh knew well. Whilst the names are changed to protect the innocent – and not so innocent – and not everyone did what their characters did – all the people existed and all the events took place but not necessarily the same people and the same events. This is a book of astonishing historical impact. I’ve read others on the topic and even spent a couple of weeks getting (I’m ashamed to say) bored by another tale with similar setting. There is nothing boring about The Train to Pakistan and it stands on its own merit for the story even without the historical importance. Singh writes in such a way that the reader can’t help but be drawn into the every-day happenings of small town life and the lives of the key characters. Nobody will read the book without knowing about the setting and so having a sense of impending doom lurking silently in the background. You find yourself hoping that this will be the one town that stands up to the madness all around yet feeling sure that somehow it will all go bad and good people will be dragged into bad actions. I was actually left at the end of the book unsure about who had sacrificed themselves (no clues about how, in what way or whether the gesture was futile or successful) and only by reading the foreword (always best left until AFTER you’ve read a book, I find) did I entirely ‘get’ the final plot twist. However, in some respects, the ambiguity that I found actually added to my interpretation of the story. Bourke-White’s photos could so easily have distracted from the story but they don’t. She has a unique style in which people are photographed slightly from below, giving them an added dignity that might otherwise be stripped by their circumstances. The living are worn and exhausted, carrying their friends, family and possessions but shown with a statuesque dignity that’s at odds with their circumstances. The dead are photographed without any attempt to lessen the horror of their situation – streets full of half decayed corpses being picked over by vultures, rivers swollen with the floating bodies of the dead. The cover carries a warning of shocking images and they really aren’t exaggerating. No Comments on "The Train to Pakistan"